Crop circles rose to popularity in the early 1990s when two Englishmen revealed that they were behind the mysterious shapes that had been popping up in Southern England for about 15 years. They consist of usually complex patterns drawn in wheat, barley or corn fields; that is, flattened areas form shapes that are visible from above and that often span areas of hundreds or even thousands of square feet. There has been a lot of speculation about the origin of crop circles, ranging from elaborate hoaxes to alien-invasion theories. But the truth remains that no one can be 100% sure of their origin. Interestingly, several accounts of crop circle findings date back to the end of the 19th century, which reinforces the belief in some people that their presence has little or nothing to do with human actions. Crop circles can be found in various countries around the world, but there seems to be an unusual concentration of them in certain parts of England. 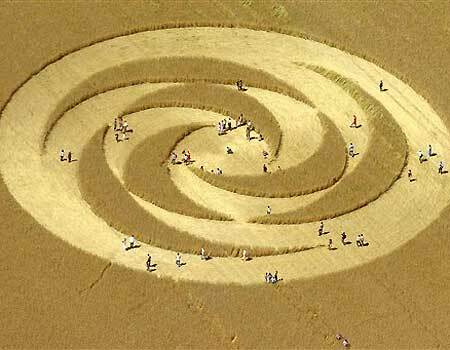 Crop circles take various forms and are often a collage of circles of various sizes. Their slick and sometimes majestic appearance tends to suggest supernatural events in the human mind. There are, however, possible explanations that don’t involve anything more sophisticated than a board, a few ropes and a small ladder. 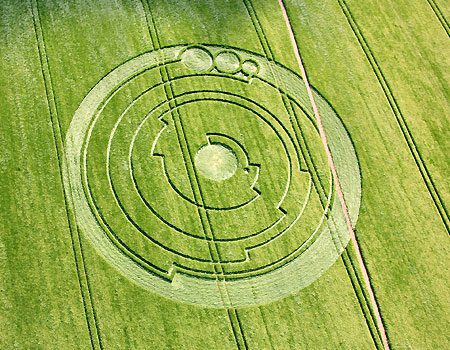 Crop circles made the news in 1991 when Dave Chorley and Doug Bower came out of the woodwork as the makers of multiple creations in the south of England. The two artists claimed to have been crafting crop circles in the south of England for about 15 years in search of fame. Several groups formed around the world to take up the skill and develop new techniques. Those events established that it is possible for human beings to make crop circles, and they shed some light on the origins of some of them. It didn’t, however, prove that all crops circles were necessarily man-made. A theory regarding crop circles that arose as early as the 19th century has to do with electrical activity during thunderstorms. According to several accounts, thunderstorms had caused damage in certain fields, leaving circular patterns not unlike those that make up crop circles. Although there is no actual scientific research to back up that theory, it hasn’t completely been ruled out. Links to possible extraterrestrial activities were inevitable and have abounded for many years. The main argument put forth to bolster that opinion is that there are various reports of UFO sightings near crop circle sites. The theories are diverse and include UFO landings, messages sent by extraterrestrial beings, or a physical representation of collective human consciousness. A variety of independent scientific (or pseudo-scientific) researchers claim to have proven the non-human origin of certain crop circles – but without encountering real recognition. Conspiracy theories of government cover ups are also widely mentioned to make up for the lack of concrete evidence to back up such theories. Crop circles continue to captivate people as a semi-solved mystery. In any case, the existence of crop circles has become a hallmark in pop culture, stimulating tourism in their home countries, while movies and TV shows offer new interpretations to the public.